Khalid Sheikh Mohammed, who is facing a US military tribunal on charges he helped plan the 11 September 2001 attacks in the US, was regarded as one of the most senior operatives in Osama Bin Laden's al-Qaeda network. The Pentagon says he has admitted to being responsible "from A to Z" for the attacks in New York and Washington. At a 2008 hearing to determine whether he was an "enemy combatant" who should remain in detention at Guantanamo Bay, he also reportedly said he had personally decapitated kidnapped US journalist Daniel Pearl in 2002. He was also said to have admitted to a role in 30 plots. He is being tried at the Guantanamo Bay detention centre, along with four other defendants accused of helping plan the 11 September attacks. The trial is expected to take years. In 2009 US Attorney General Eric Holder recommended that Khalid Sheikh Mohammed and the four others be tried in a federal court in New York City. But that plan prompted a public outcry, and the Obama administration backed away. 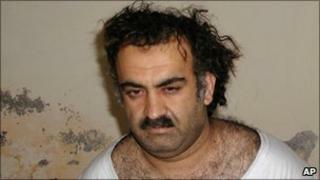 Khalid Sheikh Mohammed was captured in Pakistan in March 2003 and sent to the US detention centre in Cuba in 2006. He had been indicted in 1996 with plotting to blow up 11 or 12 American airliners flying from South-East Asia to the United States the year before. He said he had used his own "blessed right hand" to behead Wall Street Journal reporter Daniel Pearl, according to Pentagon papers. Four men were convicted of kidnapping and killing Pearl, including British national Ahmed Omar Saeed Sheikh, though subsequent investigation has cast doubt on the legitimacy of the murder convictions. Official documents have shown that Mohammed was subjected to waterboarding - or simulated drowning - 183 times in 2003, before this interrogation technique was banned. That could potentially complicate his prosecution, if testimony or evidence is deemed to have been obtained by coercion. Mohammed is believed to have been born in either 1964 or 1965 in Kuwait into a family originally from the Pakistani province of Baluchistan, which borders Afghanistan. He is said to be fluent in Arabic, English, Urdu and Baluchi. He graduated in 1986 from North Carolina Agricultural and Technical State University in the US, with a degree in mechanical engineering. Later, he moved to Afghanistan to fight the Soviets. In the late 1980s he moved to Pakistan's north-western city of Peshawar, where he met Bin Laden. Mohammed first achieved notoriety with the discovery of the plot to blow up US airliners over the Pacific in 1995 - known as Operation Bojinka. The plan was reportedly foiled when police found incriminating computer files during their investigation into a separate plot to assassinate the Pope. In 1999, Mohammed persuaded Bin Laden to back the plan that culminated in the 9/11 attacks, the US says. After the 9/11 attacks, which killed more than 3,000 people, US officials raised the reward on his head. They believe Mohammed co-ordinated the attacks and transferred money that was used to pay for the hijackings. Mohammed is the uncle of Ramzi Yousef, who was convicted in 1997 of bombing the World Trade Center four years earlier. Mohammed's arrest marked one of the most important breakthroughs in the fight against al-Qaeda. Terrorism and al-Qaeda expert Rohan Gunaratna described him as a "highly experienced organiser of terrorist attacks across international borders, one of an elite group capable of such events". It is not just the Americans and the Pakistanis who wanted information from him. French judge Jean-Louis Bruguiere issued a warrant for his arrest in connection with a suicide bomb attack on a synagogue in the Tunisian resort island of Djerba in 2002. And the Australians have been interested, because of their investigation into the Bali bombing in 2002 in which 202 people died. Recently, he has been held with his co-defendants in an ultra-high security wing of the prison at Guantanamo Bay known as Camp Seven. But a lawyer for Ramzi Binalshibh, a co-defendant, has indicated the men all would fight the charges. At a pre-trial hearing at Guantanamo Bay in December 2008, Mohammed said he wanted to plead guilty to all charges against him and said he would welcome the death penalty.